“The greatness of a nation and its moral progress can be judged by the way in which its animals are treated. The Slaughter of Badgers has begun. The total target is 5,000 badgers. The public are opposed to the killing of badgers as evidenced by the largest number of signatories on the official government e-petition, other petitions and letter writing campaigns, protests and so on. However despite this and also scientific evidence that the cull will make no difference to bovine TB the coalition government intend to go ahead anyway. but also to go ahead regardless of overwhelming public and expert opposition in the matter. Sadly here in the UK it appears that democracy is dead and what the electorate want is of no consequence. It is with deep regret that I have to tell you that licensed gunmen started killing badgers in Somerset last night. Culling is scheduled to begin in Gloucestershire later this week. The total target: 5,000 badgers. Along with a coalition of over 30 charities, the backing of eminent scientists and the work of supporters like you, IFAW argued that not only is this killing unlikely to significantly reduce bovine TB in cattle, but it could even increase it. David Cameron’s coalition Government seemed determined not to listen to us and seemingly only had ears for the National Farmers’ Union. And so the shooting has begun. Tell your MP that you’re opposed to badger culls. The Government say that the pilot culls are intended to check that this kind of shooting can be done humanely. However they have so far refused to explain how this will be measured. There is already talk of the cull being “rolled out” to the rest of the country – which makes me worry that the results are a foregone conclusion. 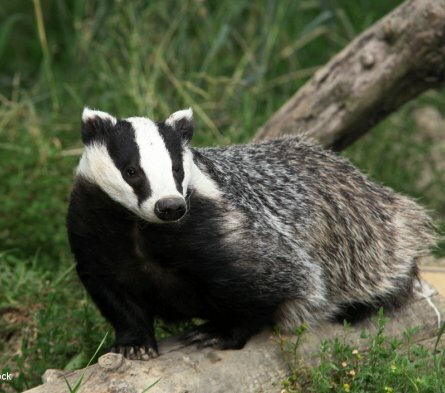 IFAW and our partner charities in Team Badger believe that it is extremely important that the reasons for any further extension of the cull should be scrutinised by Parliament before going ahead. This is where you can help us once again. Please write to your MP and ask that they sign Early Day Motion 299, which calls for full disclosure of the evidence gathered during the cull and for Members of Parliament to have the chance to study this and vote again on the issue before the cull is rolled out nationwide. Also, if you haven’t already, sign the Government e-petition. It’s already the biggest ever and a further surge of signatures this week will redouble its impact. The shooting in the pilot zones may have started, but the campaign to stop the roll out of this misguided and wanton cull has just begun. Please make your appeals to David Cameron measured. He needs to see that this cull is not in his interests, not in the interests of his Government, and that it is widely deplored by British people regardless of which party they vote for. Many members of the public feel very strongly that badgers should be protected. Whether you are in England, where the cull is taking place, or anywhere else in the UK, you can still have your say on this issue and ask your MP to take action. Please send the draft e-mail, adapt in your own words if you can but if you ‘re not able to do so just send as it is, do the best you can. The shooting of Badgers must stop now!. This is cruel, inhumane, barbaric and unnecessary. What right has anyone to kill these animals? The whole thing disgusts me. Badgers have as much right to life as you or I. Frankly the way human beings treat the other creatures with whom we share this world is appalling and it has to stop. The massacre of other animals is barbaric to the extreme and is not worthy of any ethical and socially progressive society. The slaughter of all defenceless animals must stop now!!!!!! This includes the wanton slaughter of animals as a result of hunting. Consider that people who can so easily kill another animal could just as easily kill another human being if they thought they could get away with it. I am opposed to the killing of any creature and the thought that at this time of year it is open season for the mass slaughter of defenceless animals is depressing and frankly shocking. Last Wednesday in the Yorkshire Dales hunters were out in force killing hundreds of tiny grouse. Shameful. Utterly shameful. We will never progress to be a fair and just society while we slaughter the other beings with whom we share this earth. With regards to TB the answer is simple, stop eating meat. Go vegan. It’s not about the protection of cows or people or farmers is it? It’s all about profit and greed. STOP KILLING BADGERS! STOP THE SLAUGHTER! If you can make it join the March this Sunday August 18th. We cannot allow the insatiable greed of the few to destroy the lives of the many, our countryside , our wellbeing, the very air we breathe and the water we drink!. Here in the UK the RSPB has joined with other wildlife and environment groups to call on the Government to rethink its shale gas policies. Act now before it is too late. If the government are willing to hand over Balcombe in the Tory heartland they will not hesitate to frack elsewhere. Support the people of Balcombe. Remember it will not stop there, solidarity is the key. In fact licences for two-thirds of the UK have been sold by the government to oil and gas companies, our countryside will be turned into an industrial site. “Fracking threatens our health, our communities, our environment, our climate and our future. Working together in our communities we can defeat Cuadrilla and build a better future. 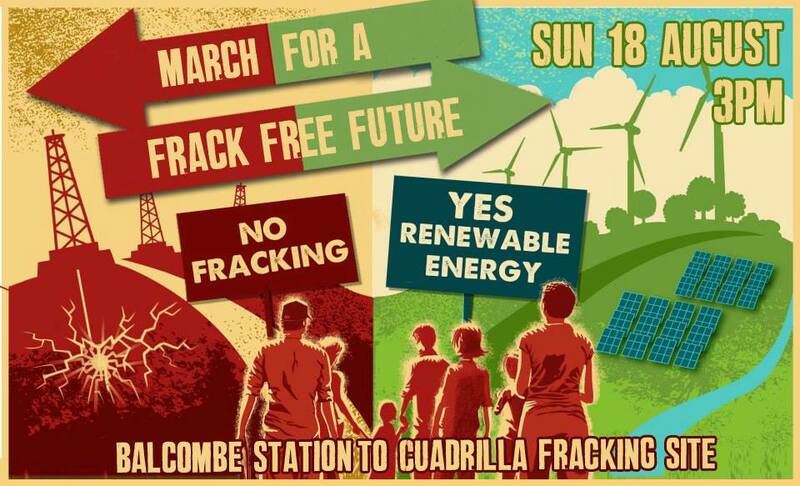 Join communities facing the threat of fracking, and residents of Balcombe, on a family friendly march to the Cuadrilla site. They will be carrying symbols of the sustainable future that they want to create in place of community threatening, climate changing, ecologically damaging fossil fuels. Every fifteen minutes a poacher kills an elephant. Unless something is done to stop poaching, elephants could become extinct within twelve years! 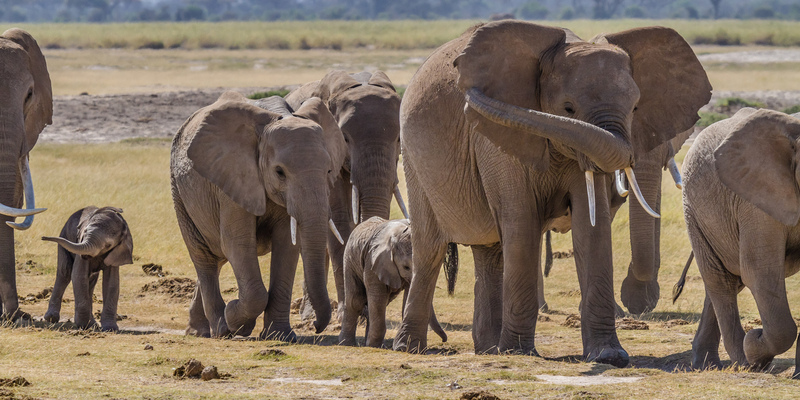 The largest land mammal on earth, the African elephant, faces constant threat from poachers whose greed has decimated elephant populations despite attempts to control the trade in Ivory. It is shocking when any animal is killed simply as a result of greed and exploitation. Though among the seemingly infinite cases of animal exploitation and cruelty there can be few more shocking examples of man’s barbarity than the killing of elephants for their tusks. Elephants are amazing creatures who are highly intelligent, rather like us they form strong emotional family bonds, they mourn their dead and may even mourn humans with whom they have had a close association. One such remarkable case is the story of two herds of South African rogue elephants who travelled for twelve hours through the Zululand bush to attend the funeral of conservationist and author Lawrence Anthony who saved their lives. Just a few years previously these once violent elephants who were considered as pests and destined to be shot were rescued and rehabilitated by Anthony who was known as the “elephant whisperer”. Rabbi Leila Gal Berner, Ph.D. Even more astonishing then their grief for their rescuer was the fact that they knew Antony was dead. How did they know he had died? As you see by this one example alone and there are many others elephants are amazing creatures, intelligent, self aware, aware of others not only of their own species but other species also. Even if these creatures were not possessed of such faculties their lives are important to them, all creatures wish to live. Intelligence, size, whether or not they interact with man or whatever criteria we humans place on animals which elevate their worth are irrelevant. Regardless of such qualities or lack thereof every animal which draws breath has a right to life, and furthermore a life free from abuse and exploitation by humans. Africa’s savannahs and forests have been turned into graveyards as contrary to what many people believe the bloody ivory trade continues . Elephants are still being killed in their thousands for no other reason than their tusks in the continuation of the bloody trade in Ivory. Thousands of elephants die as tons and tons of Illegal ivory, including the 24 tonne Malaysian consignment mentioned above, is still being smuggled out of Africa. The greatest threats facing elephants today are poaching, conflict with humans, and habitat loss and degradation. Elephants across Africa and Asia are being poached for their ivory at increasing levels. http://worldwildlife.org/species/elephant Be sure to click the How You Can Help Button. Scientists claim that elephants’ understanding of the need to co-operate shows that they belong in an “elite group” of intelligent, socially complex animals. 30,000 elephants were killed illegally last year, with their tusks selling for as much as $1000 a pound. Another reblog with an update about the baby opossums who were left to die after their mother and two siblings had been killed by a hit and run driver. The post about the slaying (accidental?) of a mother of nine can be read here. I went out to Wildcare recently to check on how the surviving baby opposums are doing. You’ll remember that there were originally nine babies, one was dead on the street and one was dead on arrival at Wildcare. Well now there are only four survivors. One died soon after arrival and then two more expired. They were very small and very vulnerable. This is such an heart-warming post, It is refreshing to know that in this cold callous and seemingly uncaring world there are people who still care for animals. Animals’ lives are important to them and they wish to live as do you or I. Sadly a fact that so many people do not take into account. Please support animal sanctuaries and rescues who do such great work in helping injured or abandoned animals. You may be surprised to know that here in the UK the RSPCA not only helps, rescues and rehomes domestic companion animals but will come to the aid of wild animals also. I have called out the RSPCA to rescue rabbits and birds. Recently there was an incident where a wounded duck was injured at a local park and the person in charge refused to contact the RSPCA with the attitude that they would not come so why bother and besides the duck seems to manage okay. The poor creature could not even put his leg down to the ground! Such callous indifference to another living creature always shocks me though I have encountered it many times. The RSPCA readily agreed to come and rescue the injured duck. So even in situations like that do not hesitate to ring the RSPCA. Support Balcombe if you can. Solidarity is the key to defeating this disastrous assault on our environment, our health and our wellbeing. This doesn’t stop at Balcombe, or Lancashire, any area of any part of the UK may become a fracking site. Check out your area: http://frack-off.org.uk/locations/ This is only the beginning! Well we all know it is not safe. Furthermore it will turn our landscape into an industrial eyesore. Fracking will not only be a serious detriment to humans of course, but animals also will be effected by noise, atmospheric pollution, light pollution and the contamination of the water supply. Yes I am desperate for cheaper energy but not at the expense of the environment and our health! However our bills will not be cheaper anyone who believes that is naive to the extreme and that is the politest way to put it! ‘Fracking poses a real threat to the local environment and causes more climate-wrecking pollution. Welcome to my blog from here in the “desolate North”, a reference to the idiotic remark made by Tory Lord Howell. Yes in the North East there are isolated wild places were few people live, they are usually referred to as National Parks or Areas of Outstanding Natural Beauty AONB and we do not want them ruined by fracking . So yes the North has large areas that are sparsely populated, other than that the definition of desolate does not apply. Besides what the hell is wrong with desolation? The beautiful desolation of virtually unspoilt nature. We need our wild remote countryside to get away for a while from the nightmare of the largely unopposed insanity of unbridled greed that is destroying the UK and indeed the entire world as greed hungry people obsessed with accruing more wealth they can spend in a lifetime destroy our planet, not only for us and the other creatures with whom we share this world but for future generations. The world is short of water, fracking takes millions of gallons of water creating shortages now and in the years to come. While in many parts of the world people die because of unclean water, here in the UK gallons of this precious resource will be used in the process of fracking, a process that is likely to contaminate supplies of a resource that is so essential to life. 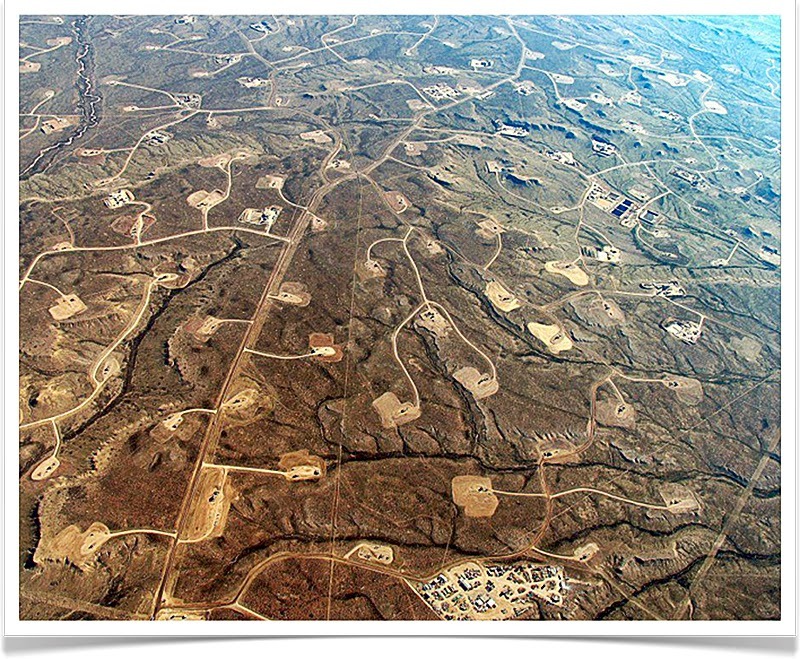 Fracking is a serious threat to the environment for the sake of profit for the few at the expense of the many. The promise of cheaper energy bills is unlikely, and even if this were true the cost to our health and our environment is simply not worth it. Fracking is one of the more outrageous forms of insanity which will destroy our countryside, our environment and endanger our health. Is there nothing this government will do to further the greed of the few. The Tories’ promised to be the greenest party ever! Fracking is anything but green, yet another Tory promise broken. This millionaire coalition government are interested only in selling everything including our NHS, making money no matter what the ethical, social or environmental cost to the people of this nation, our wildlife and future generations. Time for the Tories to live up to their promises and concentrate on renewable energies. To get an idea of what our countryside may look like see the photo further down. I am opposed to fracking anywhere in the UK , indeed anywhere on the planet. If you read no further please at least click the following links and take the required action. Did you know that your local council can refuse planning permission for fracking in your area, so email your councillors now. You can join the protest in Sussex. No Dash for Gas are holding a five-day camp in Balcombe from 16 August. Check their website for all the details. Not only are fracking wells an eyesore, fracking is highly dangerous not only to the environment, including biodiversity loss but also to public health in the form of water contamination and the release of dangerous chemicals into our environment, such as methane. There have been methane leaks in Pennsylvania, USA, where residents have found methane in their water, along with up to 27 other chemicals. In fact for such reasons fracking is of great concern to people in the USA, who like most people here vehemently oppose this destructive form of environmental damage. Here the effects will be even worse because unlike the vastness of the USA the UK is relatively small and compact. Therefore unlike the USA fracking here will inevitably take place much closer to communities or places of natural beauty such as national parks and so on. There are few wild or unspoiled and remote places here in the UK, we do not want them destroying as a result of fracking. This is shameful and an outrage, a crime against humanity and the other creatures with whom we share the earth and the very planet itself. In the name of greed the likes of Cuadrilla – an oil and gas exploration and production company – destroy the earth for future generations. Water companies are worried the process could contaminate drinking water aquifers that lie above shale gas reserves. But supporters of fracking say it is safe and essential to making the UK more energy self-sufficient. Don’t let promises of cheaper energy fool you into condoning the destruction of our countryside, the contamination of our water and the pollution of our atmosphere . “Shale gas and oil are not the solution to our energy challenges. “They threaten local communities, pollute our atmosphere and there’s plenty of evidence they won’t bring down fuel prices. This is an American website, however the dangers of fracking are of course the same. fracking isn’t about gas – it is about destroying the ancient aquifers which contain the purest water on the planet. They are also the foundation of water for the entire planet. So – get ready the explanations when your children ask for clean drinking water and there isn’t any. You better wake up to what is happening here. My husband son and I often visit old churches for architectural and historical interest. 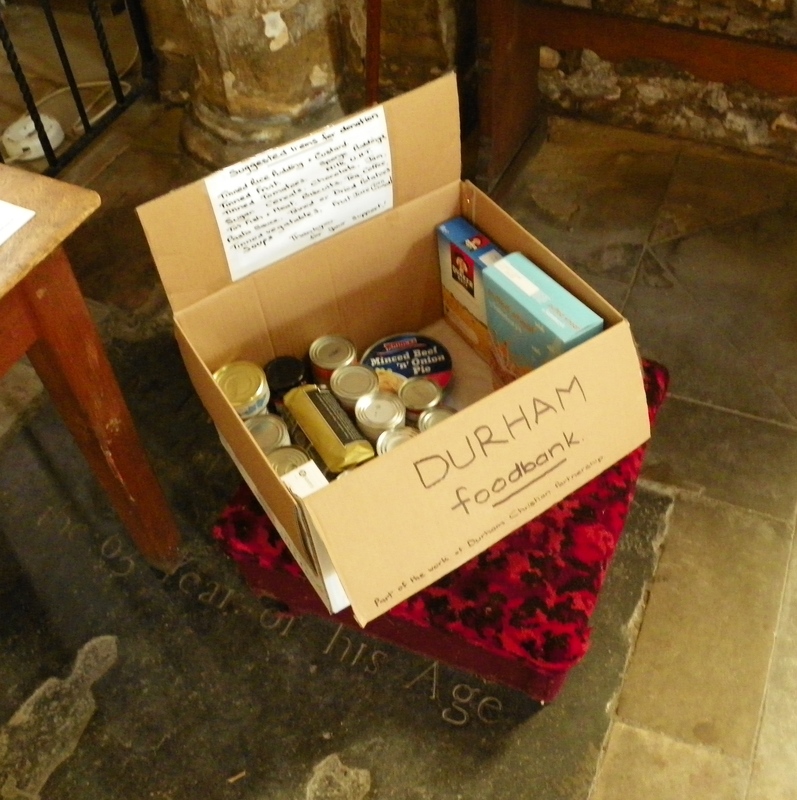 In the last year or so in many churches here in the North there can be found boxes like the one above for the purpose of collecting donations for local food banks. Incidentally some of these are situated in areas that one would not generally consider deprived, such as Cartmel in the Lake district, though as my son remarked the food bank is probably in the nearby town of Ulverstan. Ullverstand however does not exactly spring to mind when you consider poverty. If people are struggling in such places what is it like in big cities I have to ask. A sad sign of the times, times we thought had been consigned to history as the present right wing government of the unelected and financially over privileged destroy our welfare system. During the last two years or so the government by means of vicious cuts to benefits have plunged the sick, disabled and the unemployed deeper and deeper into poverty with no recourse other than having to reply on the generosity of others. And one has to say such generosity is not as forthcoming as it might well have been as the government have so successfully poisoned the minds of those fortunate enough to be genuinely able to work and who have not been made unemployed, as is the case for an astonishing 2 million plus people. “Many studies have shown that hunger affects concentration, and that well-nourished children fare better at school. The government has agreed to allocate money to help schools in the poorest areas establish breakfast clubs. And it has promised to look at extending free school meal entitlement, to ensure that the children of the so-called ‘working poor’ do not go hungry at lunch. “The government should introduce free school meals for all primary school pupils, starting with the most deprived areas, a report for the government on school nutrition has recommended. Surely we have to question why children go hungry in twenty-first century Britain, the 7th richest country in the world ! It is shameful that in a rich country people including of course their children are going hungry and food banks are under enormous pressure to provide people with the basics of life, namely food. The added disgrace of allowing children to go hungry is shocking. Furthermore it is not only the “working poor” it is also people on benefits who have seen a sharp drop in their income which at a time of ever increasing price rises has left many people deprived and in poverty. I would here just like to point out the outrage of the term “working poor”, two words that should not be used in the same sentence, no one who works should be poor, each and every person regardless of their type of work should be paid a living wage. Life is precious we should not be compelled to while away our lives scrimping and scrapping to get by on wages that are exploitative and do not provide a decent standard of living not only for essentials but to ensure that everyone has a quality of life beyond the basics. Working forty or more hours each week, most people work considerably more, for a pittance and needing to go to food banks is a moral outrage while employers are laughing all the way to the bank and living life styles far in access of their needs. Moreover no one who needs benefits by reason of disability, sickness or unemployment should have to have their already difficult lives made worse by impoverishment. Often we hear the phrase “make work pay”. People complain that those on benefits are better off than many who work. And as a solution many advocate a reduction in benefits. However this does not solve the problem of poor wages and instead plunges disadvantaged people into poverty. Think about it, if a person on a benefits has their income reduced how does this benefit the low paid? People on unliveable wages will not get any more money. Instead of thinking it right to reduce benefits to make work pay how about increasing wages to make work pay. Sadly the fact that children are suffering the consequences of welfare reform and austerity measures seems to escape the notice of those who consider that reducing benefits is the right thing to do. It is as though we are taking steps backwards to a time that many people thought had been consigned to history! The coming changes to benefits in the autumn is of great concern to those of us who consider that everyone should have enough money for life’s essentials. One of the greatest concerns is that such changes will hit poor children in Britain hard. The very idea that here in the UK a child will be at school hungry is beyond shocking, it is inhumane and not worthy of any country that wishes to be considered as moral and socially progressive. Children, the unemployed, the low paid and the sick and disabled are not the only people hit by a drastic reduction in living standards, many retired people living on a basic pension find themselves with less disposable income than an eleven year Old! “Shocking research has revealed that two million pensioners have less disposable income then the average 11-year-old. The report revealed that this group has an average state and private pension bringing in £154 a week, but average living costs of £146.90. It leaves them with less ‘pocket money’ than the average 11-year-old – who is given £8 a week by their parents. It is surely time to question the ethics of anyone in the 7th richest country in the world living in poverty while others have far more then they need.